Online reviews are a powerful tool to raise a hotel’s profile and strengthen their brand. Unfortunately, many hoteliers underestimate the influence of online reviews and instead focus on other matters they deem more important. Even more, when a negative review is posted hotels are not sure how to handle customer complaints. The overwhelming majority of travelers (93%) read online reviews before determining which hotel to book. If hoteliers are not prioritizing their online reviews, their business may suffer. 83% of travelers say TripAdvisor reviews help them feel more confident in their travel decisions. Considering the immense competition hotels face, putting more time into collecting online reviews is definitely a smart investment. To inspire as many positive reviews as possible, hotel staff should reach out to guests during their stay. In doing so, the hotel can gauge each guest’s overall experience so far and immediately solve any issues they may be facing. This will ensure that every single guest checks out feeling happy and appreciated, and will be much more likely to leave a positive review. In general, before guests are asked to write an online review, they should have something positive to write about. If a guest leaves unhappy with their stay and leaves a poor review, the damage can be catastrophic. According to a recent study, businesses risk losing over 20% of potential customers, even those seriously considering purchasing, with just one negative review. This number skyrockets to 70% if they have more than 3 negative reviews. To keep this from happening, hotels need to know how to handle customer complaints. Your hotel’s website already contains lots of useful information for guests, so why not also include a call-to-action asking for an online review? Considering how almost 50% of travelers say they write travel reviews, your hotel should be capitalizing on this large pool of eager travelers that are willing to give feedback. Enabling this feature also helps those users who are planning their next hotel stay come to their decision faster. Having all the hotel information — including previous guest reviews — in one place will enrich the user’s experience and better convince them to book. Over 75% of travelers would be willing to pay more for a hotel that has positive reviews, so there is a significant opportunity to boost revenue. A review section can be easily added through TripAdvisor’s review widget. This free tool not only makes it extremely easy for your guests to leave their review, but also comes with useful features like the ability to promote your latest reviews and awards. While checkout should not be the first time a guest is prompted to leave a review during their stay, it is still an important touchpoint. As part of the checkout process, staff should use this opportunity to detect any last minute guest issues and resolve them before the guest leaves the property. After this last check is complete, staff should ask the guest if they had a positive experience and remind guests to leave an online review if they did. This works with mobile checkout as well. Guests will be more inclined to write a personal review if they believe it will bring value, so staff should remind the guest that reviews help hotels detect opportunities for improvement and help other travelers make their decision. Handing guests a business card demonstrates relationship building and will create loyal customers. On the back of the business card, let your guests know that you would love to hear about their experience at your property. Be straightforward, honest and to the point. Something similar to, “Thank you for staying with us. Take a moment to tell others about your stay on TripAdvisor,” is a great way to encourage customers to leave a review. 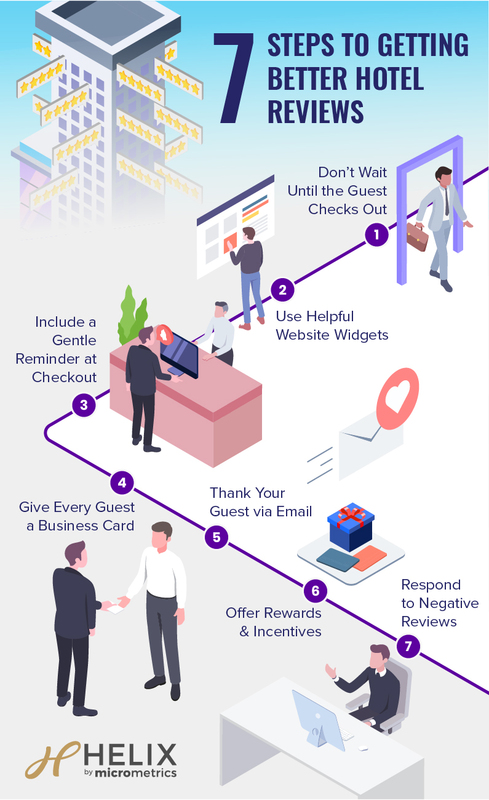 While personally asking the guest to leave a review is an effective way to collect feedback, giving the guest a physical reminder may leave a greater impression and increase the number of reviews written. Every guest should receive an email after checkout thanking them for their stay and gently reminding them once more to leave a review. A personalized note will not only strengthen your relationship with guests — but also humanize your brand. Additionally, this establishes loyalty and helps create guest advocates. Adding a review reminder to these emails is a simple way to accomplish this. Showing appreciation and humility similar to, “We would greatly appreciate if you could take a moment to share your experiences at our property on TripAdvisor” could add an extra layer of service and helps establish a positive brand image. Some guests may need more encouragement than others. By offering rewards or incentives, this may just be the push your happy guests need to share their experience. With that being said, hoteliers should be cautious of the incentives they offer and how they offer them, as bribing guests for hotel reviews can be seen as bad practice. In general, most hotels know how to handle customer complaints while they are on property. But what happens if the complaint comes after checkout? Hotels should still view negative reviews as service recovery opportunities, and respond to any negative comments with the same mindset. Not only will this improve the commenter’s view of the hotel — but it will also help improve the reader’s views — as 85% of readers admit that when hotels respond to negative reviews their impression of the hotel improves. For the most meaningful results, the hotel’s response should be thoughtful, timely and personal. Making the reviewing process simple and seamless will significantly improve the volume and quality of reviews. Positive reviews do not only help with brand building, but also directly impact key performance metrics, such as rankings on review sites and on search engines. Check in with guests before they check out. Learn how Helix provides real-time alerts and engagement that fuel in-stay service recovery opportunities and view a case study here. to significantly improve overall scores.